At Arkwright Insurance, we offer competitive quotes on van insurance cover. Depending on your vehicle and how you use it, we strive to provide you with a premium that’s specifically tailored to match your unique circumstances and budget. We’re proud to have helped many satisfied customers up and down the UK with finding the right van insurance cover at the right cost. Just like with a car, it's a legal requirement to hold valid van insurance if you'll be driving around on the road. You'll need an insurance policy to cover your specific usage - whether it's for business or personal use - to give you the peace of mind that you're protected financially in case of any unexpected problems. Similar to car insurance, there are three levels of cover you can choose from, with Third Party Only being the absolute minimum requirement. This will only insure you for any damage caused to other drivers and their vehicles if they make a claim off you. Increasing levels of cover, however, can also grant you the ability to make a claim if your van or possessions should suffer damages. Depending on your policy, a Third Party Fire & Theft policy will cover you for fire damage and theft of your van, whilst damage to the structure, glass or even personal injuries may be covered by a Comprehensive policy. Factors including the age, model and mileage of the van, as well as your driving history and the van's intended use will inform the overall price of your premium. Whether you use your van for personal leisure, independent business or as part of a larger company fleet, getting the right insurance for your vehicle is vital. Depending on the van you have and how you'll be using it, there are different types of van insurance and it's important that you choose the most appropriate one to suit your needs. 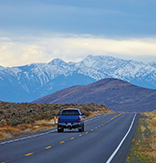 Standard van insurance: These policies may come with limitations and restrictions like caps on mileage and a minimum age for named drivers. A standard insurance policy should provide cover for contents inside the van like tools or trade items just in case anything should happen to them while you're out and about. However, possessions may not necessarily be covered if left in the vehicle overnight. Courier insurance: You may be using the van to deliver goods, causing you to be on the road longer than a simple commuting vehicle. 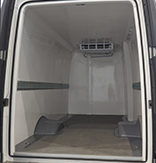 This type of cover can take care of things like physical wear and tear or faults occurring, as your van is more likely to spend more time in operation. However, courier insurance does not typically cover the actual goods being transported, which would instead require a 'goods in transit' policy. Goods in transit insurance: For a business using a large vehicle to transport cargo, a 'goods in transit' policy will be necessary. This will require you to notify your insurers of the kinds of items you'll be transporting, whether this amounts to retail merchandise, edible perishables, items that are highly valuable or even potentially hazardous products. Goods in transit cover can be combined with courier insurance to ensure both your vehicle and its contents will be protected in the case of any accidental damage or theft. When you choose Arkwright Insurance, we endeavour to find a modern insurance policy for your classic car. We offer a hassle-free process to provide a competitive insurance quote based on an agreed valuation of your car. As classic and vintage car insurance is a specialist field, we have a team of experts ready to take your call and speak to you about the ins and outs of what you need. In some cases, you may be able to get a rough estimate from us first using our online quote builder, but then speak to our team directly to fine tune your insurance to match your specialist requirements. To get started with our online quote builder, click the "Get a quote" button on this page. Alternatively, you can speak to one of our expert team directly by calling 01204 392 525 and discussing your van insurance needs. 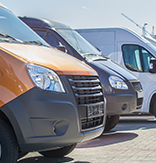 For more specialist types of van insurance covering various uses and purposes, take a look our Specialist Insurance options below to see how we can help you with a more tailored service. 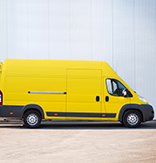 Find cover for your imported van if you're struggling to find its vehicle group in the UK. 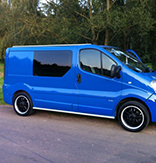 We can insure vans that have been modified for all sorts of purposes. 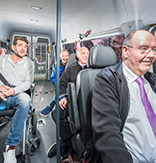 Increased liability cover suits vehicles that are capable of carrying more passengers. Whether used as part of a company or your own independent business, make sure your van has appropriate cover. Such a specific vehicle requires a specific kind of insurance policy, which is essential to carrying out business. Keeping certain produce chilled in transit is vital, so protect your business and cargo in case of power failures. If you're using a van that's imported or features left-hand drive, we can track down those hard-to-find policies. Whether personal or commercial, we can provide insurance quotes for large vehicles used for various types of cargo. Cover for vans, trucks and HGVs of any size used for commercial purposes. 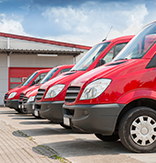 Fleet insurance policies are available to cover all of your vans, whatever your business requires them for. 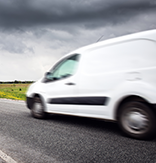 Multi-van insurance policies are tailored to meet your specific needs on an individual basis. When you call Arkwright Insurance, a member of our experienced team will ensure that we supply a policy tailored just for you. We go beyond the usual criteria of your age, your van's condition, location and expected mileage to provide you with appropriate cover to perfectly match every little aspect of your specific circumstances.